Christian Bables on working with Martin del Rosario: "There is no room for issues anymore." Christian Bables on working with Martin del Rosario: "There is no room for issues." 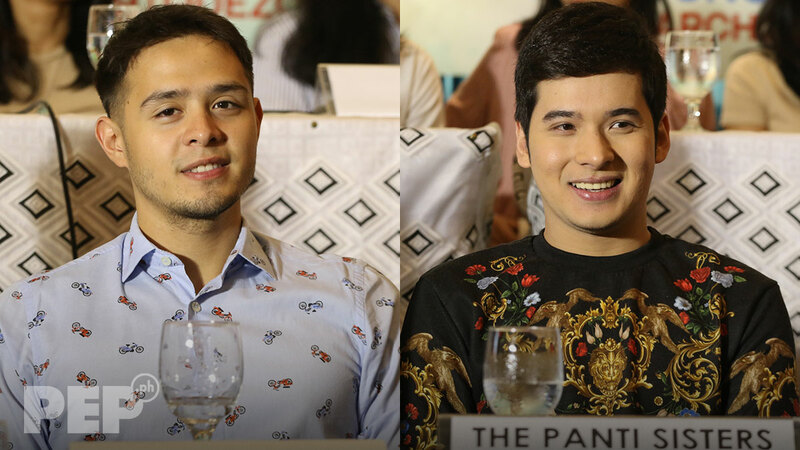 Martin del Rosario on working with Christian Bables: "Nakakatuwa dahil nabuwag yung issue issue, nawala, e."
Martin del Rosario and Christian Bables, who both portrayed the iconic role of Barbs in the Die Beautiful movie series, are excited for their first movie together. In Die Beautiful, Christian played Paolo's best friend named Barbs. He was supposed to top-bill its spin-off, Born Beautiful, but had to leave the production in November 2017 due to undisclosed reasons. Martin served as his replacement. When Martin replaced Christian, this prompted Die Beautiful fans to engage in social media discussions on who deserved to play Barbs. Fast forward to 2019, Martin and Christian are set to top-bill the upcoming movie titled The Panti Sisters, together with Die Beautiful lead star Paolo Ballesteros. The movie is one of the first three entries announced as part of the Pista ng Pelikulang Pilipino Year 3. This is also Christian's comeback movie with The IdeaFirst Company, headed by Jun Lana and Perci Intalan. In an interview held at the PPP press launch last March 28, Martin and Christian told PEP.ph (Philippine Entertainment Portal) how excited they are to be working with each other. Martin said, "Ako, inisip ko, noon pa lang, nilook forward ko na sana, although, walang nagbanggit sa akin nito. "Pero, inisip ko lang, siguro, ang gulo gulo nga kapag nagkasama kunyari, kaming dalawa, kasi yun na nga, parehas namin ginawa yung Barbs. tapos alam ko magaling na artista. "Inisip ko lang, 'What if magkaroon ng ganyang movie?' E, nagkatotoo. "So, naexcite ako tapos si Paolo, nakasama ko siya konting scenes lang sa Born Beautiful, pero yun yung mga favorite ko." Christian said, "Ako, ang nilulook forward ko, more than yung good working relationship, I look forward for us being friends. "Ako, si Martin, si Paolo, kasi iba yung... kagaya kami ni Pao, yung naging friendship namin, yung rapport na nabuo namin sa Die Beautiful, iba, e. Solid. So, I'm hoping ganito dito sa Panti Sisters. As early as the announcement, the project has been receiving positive reactions from their fans. Martin said in jest, "Pinost ko na, nakita ko na yung reactions, grabe excited lahat. "Nakakatuwa dahil nabuwag yung issue issue, nawala, e. Parang lahat nagsupport and naexcite dahil sa Panti Sisters. Christian added, "Actually, nakita ko na yung mga comments, ang gaganda. "Of course, hindi mawawala diyan yung may issue pa rin, konti, pero ano ba, nandito na kami o. Ako, si Pao, si Martin, I think there is no room for issues anymore." Martin and Christian only met each other for the first time during the PPP presscon. What can they say about each other after going through controversies in the past? Martin answered, "Okay naman. Sa totoo, wala naman talagang issue between us, yung mga tao lang gumagawa. "Kaya ako, hindi ko pinapalaki, alam ko siya, di pa nga kami nagkikita, paano kami magkakaissue? Christian added, "Good thing na bago kami maapektuhan ng mga sinasabi na ang mga issue ang gumagawa ay ibang tao, hindi namin minind yun, kasi nakakatingin kami sa isa't isa ngayon. "Kumbaga, meron pang room for us to know each other and for us to be good friends." Martin believes they were able to deal with the issue properly, which is why there is no animosity between him and Christian. "Nasa tao kasi yun, e. Parang, kumbaga, kunyari, tayo yung type na palaban, kung ano ano pagsasabihin mo diyan, or hindi maingat sa sabihin.... Pero siguro dun kami parehas, wala." According to Martin, shooting and look test for the movie might commence in May 2019.